Some times it's preferable that you run analysis job on a remote supercomputer while doing modeling and visualization on a tiny laptop. Here shows an example of how to setup. 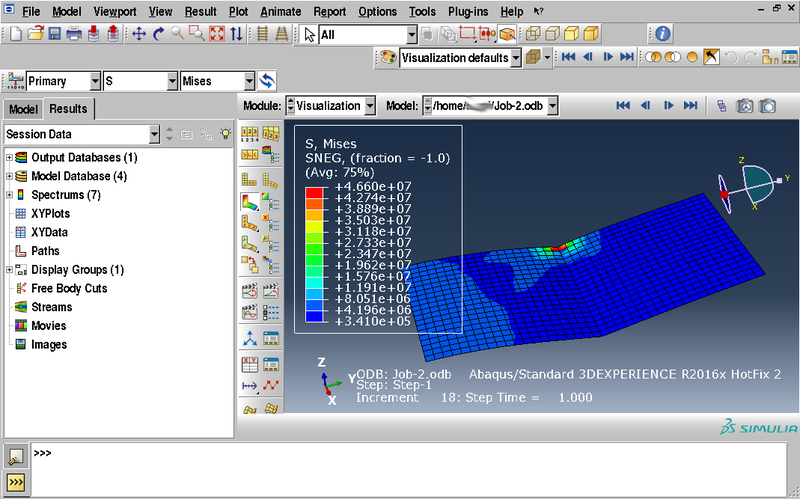 I will use Abaqus 2016 as an example, but the method should apply to Abaqus releases recent enough. Replace the 3rd line, DSY_OS_Release=`lsb_release --short --id |sed 's/ //g'` with DSY_OS_Release="CentOS"
You may encounter lib****.so not found message in console when trying to launch Abaqus. Just install the corresponding package using apt. Typically you will need libjpeg62 and libstdc++5. Local operations are fairly straightforward, just tell Abaqus that a remote queue for submitting jobs is available, using the Abaqus environment files, as described in 19.2.7 Submitting a job remotely of Abaqus/CAE 2016 User's Guide. # The queue name that you want to appear in the job editor. # The name of an existing queue on the host computer, will explain later. # The IP address or Domain Name of remote computer. # Select which result files to copy to local, typically not needed. If you start Abaqus using command abaqus cae and create a job, the queue will appear in the Submission tab of Edit Job window. Abaqus Error: No queues have been defined. Please define one or more queues in the environment file. This is because that there are no queues to accept the submission at the remote computer. So let's move to re. You need to be able to access the remote computer via SSH as Abaqus submits job through it. There shouldn't be any prompt for you to enter a password, local user name and remote one should be same. In a word, you should be able to directly see the command prompt on the remote computer using a single local command ssh <remote_ip_or_name> . For more information about different queue types, refer to 4.2 Defining analysis batch queues of Abaqus Installation and Licensing Guide. Making your own queue class is also possible. The remote computer surely can not locate your local computer via the hostname ruoxi-Desktop if they are not on the same subnet. I've not found a way to change this to an IP address or Domain Name yet, and my solution is changing /etc/hosts on the remote side. After the operations above are done, your local computer should be able to submit the job to the remote machine and retrieve result files when the analysis is completed, the job monitor still functions as if you are doing analysis locally, but you cannot view results until the analysis finishes. Viewing results before the analysis complete is possible via ODB connector, but I'm getting permission denied error on my remote machine so maybe I can cover it in the next update.